In reality, according to Pakistani authorities, Faisal Shahzad, the would-be car bomber, attended a jihad training camp in that country. He spent five months in Pakistan recently, including some time in Peshawar, a center of Al-Qaeda and Taliban activity. A Pakistani Taliban group claimed responsibility for the attack — a claim that American authorities immediately dismissed, but which gained a new claim to serious consideration when Shahzad’s Pakistani connections were revealed. Help struggling homeowners, or they’ll try to set off car bombs in Times Square! Nonetheless, New York Mayor Michael Bloomberg was likewise preoccupied with this phantom threat of a backlash, warning New Yorkers several times of any action against Muslims or Pakistanis. Bloomberg ought to be ashamed of himself. He should have been making statements about protecting Americans of all creeds, and calling the Muslim community in America to account for its tolerance of jihadists. There has never been a backlash against innocent Muslims in the U.S. It is a fiction that we only hear about when a Muslim plots mass murder of Americans. And then we hear about it endlessly, as if Muslims were the victims rather than the perpetrators. 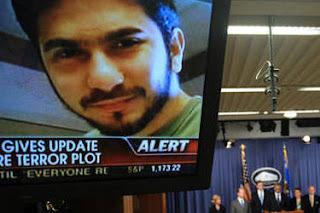 Faisal Shahzad and his car bomb is yet another indication of the tenacity and persistence of the jihad against the United States – and of the continuing and even hardening resistance of American officials to the elementary step of even admitting that jihad is being waged.